This section covers only those tools needed for the electrical repairs. Items required for cabinet restoration are mentioned in the relevant section. One of the most important items is a good soldering iron. Look for one rated at around 35 to 50 watts, as anything smaller will prove to be inadequate for larger tags etc. This does not need to be particularly fancy, but avoid the really cheap ones sold in DIY stores, as they tend to fail within a few weeks. Antex or Weller soldering irons are good value for money and are recommended. Weller are generally better regarded than Antex by professional users. If you already have a good lower power (15 to 25W) soldering iron, you could instead choose to supplement it with a Weller 100W soldering gun. These are trigger operated, reach working temperature within about ten seconds, and as such are ideal for use when your smaller iron cannot cope. However they are quite bulky and awkward compared to conventional irons. A good desoldering tool (solder sucker) is essential. Get the spring-loaded type, as the squeeze-ball style is not vigorous enough. A pair of electronic wire cutters is another essential. The trouble is that good-quality professional side cutters are not cheap at around £23 - £30. If you will be using them regularly, this sort of expense is not unreasonable for a tool that will last for years if treated with care, but for occasional use something cheaper is called for. Cutters like those shown here are available for under £3 from CPC, and will give good service if looked after. Tandy and Maplin probably sell something similar. They have the added advantage that it is not too much money to lose if they are lost or broken! A pair of larger, more substantial wire cutters are also necessary for cutting mains flex, small bolts etc. Long-nosed pliers are handy for forming component leads, holding items being soldered, and manipulating small nuts and screws in awkward corners. A good set of new screwdrivers will make the job so much easier than a motley selection of old tools. I like the red and blue handled own-brand range sold by Woolworths; these are available singly and in sets, and are very good quality and excellent value for money. Currently a set of around 15 screwdrivers is being sold for about £10. DIY and car accessory stores will stock their own-brand products, which would also be good quality and value. In addition, you will probably need a 5/16", 1/4" and 3/16" nut spinners (for 2BA, 4BA and 6BA nuts respectively). A small adjustable spanner is useful for releasing pot and switch nuts and other similar fixings. A set of jewellers screwdrivers are handy - the smaller sizes are ideal for bending valve holder contacts inward to tighten them, and the larger for releasing grub screws etc. Finally, a 1/2" paintbrush is helpful for removing many years build-up of dust. None of these items should cost too much if you shop around. Another handy tool is a rechargeable power drill. The advantage of this type over the more normal electric drill is that they run at a slower, more controllable speed. The Power Devil power tools sold by Homebase and ScrewFix Direct are fairly good quality (adequate for light duty work) and good value for the money. In a similar vein there is Skil and Power/Performance (sold by B&Q). If you want something more durable and suitable for DIY work too, look at Black and Decker, Bosch or one of the other major brands. The test equipment you need to get started is minimal. A multimeter is essential, but most electronics enthusiasts will have one already. A cheap digital type is ideal, and has the advantage of a high input impedance. Personally I do not like auto-ranging meters, because they take too long to settle. You should be able to buy something suitable from Maplin, Tandy or CPC for under 30 UK Pounds. This is the one piece of equipment I would always buy new, because they are cheap and it is not worth the risk of using a second-hand instrument that may be inaccurate or unreliable. It is also the piece of equipment you will use most often, so buy the best you can afford. I use a Maplin Precision Gold digital meter (model M810), costing around £70, which includes frequency measurement, and capacitor, diode and transistor testing facilities. These extras are more useful for testing transistor equipment, but they probably only added about £10 to the price. Some repairers hate digital meters, and swear by analogue types. It's really a matter of personal choice. If you want to go for analogue, choose a model with a large, clear scale. A small cluttered scale will put you off analogue meters for life! The Avo 8 is the undisputed leader for vintage radio work - but they don't come cheap. Eventually you will need to realign the RF and IF circuits of a set, and for this you will need an RF signal generator covering the range 150KHz to about 12MHz or maybe higher, and possibly also 87MHz to 100MHz. It must also have an option to amplitude-modulate the output with an audio tone. I had an Altai unit (left) costing over one hundred pounds new, and a Heathkit unit (right) which cost me about five pounds in an auction. After a couple of basic repairs, the Heathkit works much better than the Altai - the waveform shape is better, the amplitude more consistent as the frequency is adjusted, and a greater depth of modulation is possible without significant distortion. The Altai has now been sold! Signal generators are sometimes included in vintage radio auctions, and often sell cheaply. In a recent Radiophile auction there were about four, and all sold for less than £5 each. They may well not have been fully working, but the circuit is generally fairly simple (using just two or three valves) and should not be too difficult to repair. My Heathkit unit came from such an auction, the circuit uses two valves, and the only faults were a couple of dry joints, a noisy pot and a missing knob. I also replaced the mains flex with 3-core cable, and earthed the case. The design for an inexpensive basic signal generator is included elsewhere on this web site. I have also designed a simple audio output level indicator for alignment purposes. This has a low cost analogue meter, which reads full scale when the audio level is about 1 Watt into a 3R speaker. I make no claims for its accuracy and linearity, but it is ideal for finding the peak position of an adjustment. You may find it convenient to build this into the same case as the signal generator. 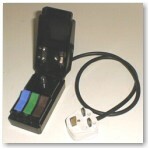 Alternatively an analogue test meter will do the same job if set to a low AC voltage or current range. A Variac (variable autotransformer) would also be useful, but it is probably not worth spending the money unless you are doing many sets. Note that most variacs does NOT provide any isolation from the mains. The same can be said for a valve tester. These are available second hand, and AVO units are generally regarded as the best. Make sure you get a copy of the manual, and the settings for a wide range of valves with it, otherwise it will be no use to you. Copies of the manuals are on the Valve Data CD-ROM. I use a Mullard High-Speed Valve Tester that uses punched cards to set it for specific valves. It is very quick and easy to use, because they were designed for use by non-skilled shop operatives and have a scale clear enough for Joe-public to understand. It does not give such detailed information as the Avo unit (but then the Avo ones are more expensive), but is fine for simple go/no-go testing. If you are offered one of these, make sure you also get the two boxes of punched cards, the cross-reference lists and the instruction manual. Be warned that they are very heavy! I paid £25 for mine a few years ago - now you would be looking at £50 - £80. For occasional repairs it is cheaper (and less hassle) to get the valves tested by a dealer or fellow enthusiast who has the appropriate equipment. Many repairers manage fine without a valve tester, and rely on the results obtained in the actual set. If you have a stock of valves it is often quicker to try another one in the set than testing the suspect one. However I do find my tester useful, particularly when in doubt as to whether the valve or the set is at fault. I also like to test rectifiers and output valves as a matter of course, because serious faults here can have dramatic consequences! A small loudspeaker in a wooden cabinet is useful when testing a chassis that has been removed from the cabinet. A speaker from an old stereo system (obtained from a car boot sale for a couple of pounds) is ideal. Use a 3 or 4 ohm unit if possible - some of the cheaper stereo systems (such as many Fidelity models) used 16 ohm speakers. I have a speaker mounted on the workshop wall, with the connections bought to a pair of terminals mounted conveniently by the bench. This allows me to get the radio's cabinet off the bench and out of the way. For initial tests, a high voltage DC (about 250V) supply is useful. This should have a high output impedance (or a resistor in series with the output). This need not be very complex - a suitable simple design for this, described as a capacitor reformer, is also included on this web site. Alternatively, the set may be initially powered with a 100W light bulb in series with the supply. This provides some current limiting, which can avoid expensive damage in case of a fault. It is worth mounting this lamp, together with a mains socket and a bypass switch on a piece of wood. This arrangement is described elsewhere on this website as a series lamp limiter. A SafeBlock or similar is a real time-saver. This simple device allows you to connect an item to the mains without having to fit a plug first. It has three coloured clips, protected by a cover. When the cover is open the live and neutral clips are isolated so the wires to the appliance can be connected safely. With the lid shut the clips, and therefore the appliance, are live. The fuse lives in the lid, making it easy to change. These units were in common use in electrical retailers some years ago, but are now largely redundant due to all new appliances being supplied with fitted plugs. Another piece of equipment that turns up in auctions, and is useful if you can get one cheaply, is a Megger or insulation resistance tester. This instrument measures resistance up to 100M or more while applying 500V DC. It is particularly useful if you are selling restored sets and wish to make sure they are safe. The Megger I bought in a recent Radiophile auction cost me just £1, and although it is missing the battery cover, it works fine. Being transistorised there is not much to go wrong, apart from the meter movement. One day I will get around to cleaning the glue and muck off the case! If you are repairing transistor sets (portable and car) it is worth purchasing one or two regulated low voltage power supplies. I have two of the Altai units shown here. The output is switchable to 3V, 4.5V, 6V, 7.5V, 9V and 12V at 1.5A. It is worth having two for those sets that use two batteries (such as some Hackers and Roberts that use two PP9s). These power supplies cost under £10 each from CPC, and will save a fortune in batteries, especially when a faulty set consumes too much current. As you may gather, vintage radio auctions can be a good source of test equipment. As well as the items mentioned, Variacs, isolating and 240-110V transformers, and oscilloscopes sometimes feature - and generally sell cheaply. In a recent BVWS auction at Wootton Bassett a good working oscilloscope sold for £5 and two working signal generators sold for under £10 each!